Over the 10 years since Douglas Oulton was diagnosed with Parkinson’s disease, if there’s one thing his family has learned, it is that Parkinson’s is a family disease. It has reached into nearly every aspect of their lives. 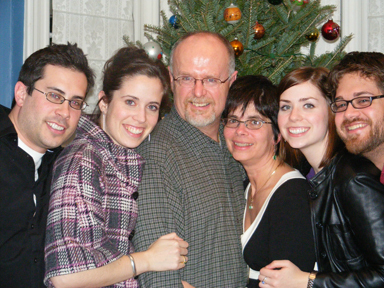 The Oulton family (left to right): Christian, Rebecca, Douglas, Pam, Sarah, and Nathan. When Douglas was diagnosed with Parkinson’s disease on Valentine’s day in 2000, he was 44 years old. He and his wife Pam were raising four teenagers. He worked as vice president of finance for a manufacturing company. Life was good. Then Parkinson’s disease set the family on a path they never anticipated. Medications also caused some strife. Some medications that enabled Douglas to work from early in the morning until late at night had the side-effects of increasing his anxiety level and making him so paranoid that it was more than Pam could bear. She eventually asked Douglas’ neurologist to take him off those medications which have since been taken off the market. Dealing with the side-effects of medications, particularly dyskinesia (involuntary movement) is an ongoing concern. Douglas has also had deep brain stimulation surgery which has helped restore some of his ability to smile and laugh.